Bring your lunch to the Chapel of Four Chaplains and sit in the pews while Bill Kaemmer, Executive Director, gives a short lecture and tour of the chapel. Free, no pre-registration required. Join Bar Amis for the first Cage Match battle of 2019 as Scott Reddy, Chef of Bar Amis, dukes it out with Damon Menapace, Chef of East Passyunk’s Le Virtu. $60 per person includes 4-courses, 2 dishes each, and one winner! Join the Chapel of Four Chaplains at the South Philadelphia IATSE Ballroom for the 51st Four Chaplain Day Banquet, honoring the Chaplains and the crew of the USAT Dorchester. The Navy Yard is hosting an American Red Cross Blood Drive at the Courtyard Marriott Philadelphia South from 9:00 AM to 2:00 PM. Our goal is to collect at least 35 pints of blood (one pint per donor) – with each pint going on to save three lives! Please register in advance at the event website. Bar Amore, the Bar Amis alter ego for Valentine’s Day, is offering a week long special menu with the choice of one app, one main, and one dessert only $35 per person! Draw with Philadelphia-based artist, Miriam Singer. This month AIGA will be at FS Investments in the Navy Yard, where Miriam’s works is prominently featured. Learn more about here work and participate in a drawing exercise — some supplies with be provided. Refreshments will be provided by FS Investments. Building 543 hosts an ever-changing roster of local entrepreneurs, gardeners, artists, shops and designers who bring items like handmade jewelry, homemade chocolates, vintage clothing, home goods and much more – to give employees and local residents a chance to browse and shop unique items. Each month’s vendors are announced on Instagram @URBNCommunity. Want to learn more about Penn State’s AASCB-accredited MBA program offered at the Navy Yard, but can’t leave your desk? Join us for a one-hour webinar to hear details on our program, admissions process, and scholarship opportunities. Attendees will receive an application fee waiver. Join Penn State at the Navy Yard and PIDC for an interactive panel discussion on how you can leverage LinkedIn and other social networking platforms to build your brand and network, engage with people outside of your industry, and share and receive information that can be valuable for career advancement. Lunch is provided. Free, but pre-registration required. Register for Monday, Wednesday, & Thursday Spring Sports Leagues with Philadelphia Sport Leagues. Form a team with friends, co-workers, or join as a free agent. Register for Tuesday Spring Sports Leagues with Philadelphia Sport Leagues. Form a team with friends, co-workers, or join as a free agent. Mark your calendars, Philly’s favorite food trucks are coming back! Keep an eye out every week as we announce the schedule on the Navy Yard’s social media channels. Welcome to the Navy Yard! Your first few days in your new role are important, so let us help you get oriented in this place! If you’re new to the Navy Yard, join us for a brief welcome presentation, history overview, and introduction into what our community has to offer. Following the presentation, you can join an optional Guided Site Tour in our Navy Yard van. This event is free & pre-registration is required. Space is limited. Coffee and snacks will be provided. In partnership with the 19th Street Baptist Church, the Chapel of Four Chaplains hosts an 8:30 AM Bible Study/Sunday School and a 10:30 AM Church Service. We run all year long! Join your fellow Navy Yard employees for a free, weekly all levels group run around the Navy Yard! The Navy Yard Running Club will meet for a 2-5 mile run or interval run, ending with runners’ specials at Bar Amis. Follow us on Instagram @NYRC_phila. Philly Foodworks is a local online Farmers Market like no other. Choose from flexible options that include fresh, local vegetables, fruits, pantry items, eggs, bread, meat, yogurt, and cheese! Pick up is at Building 101. Navy Yard employees can receive $15 OFF the first order with offer code: NAVYYARD. Toastmasters International is a non-profit educational organization that teaches public speaking and leadership skills through a worldwide network of clubs. The Toastmasters Sub and Surface Club meets at the Navy Yard. Please contact the Club at 215-983-4897 for meeting details and further information. Available only through curbside takeout, feed the fam this Super Bowl Sunday with super deals from Bar Amis. Purchase 50 wings for $50, 25 meatballs for $50, 5 lbs of pulled pork for $50, or 5 lbs of chicken salad for $50. Save 20% on your next dine-in visit or 10% on catering. Visit Mercer Cafe today to learn how to take advantage of this offer. Treat yourself, or a friend, to Nava Yoga’s First Month Unlimited Special. Sign-up for a Monthly Unlimited class card for just $69 on your first visit and choose from over 30 classes a week for less than $2 a day. Sick of waiting until spring to hit the links? The Vincera Golf Experience offers a menu of virtual PGA courses, state of the art motion technology, and fitness consulting to improve your golf game. Join the experience for $199. 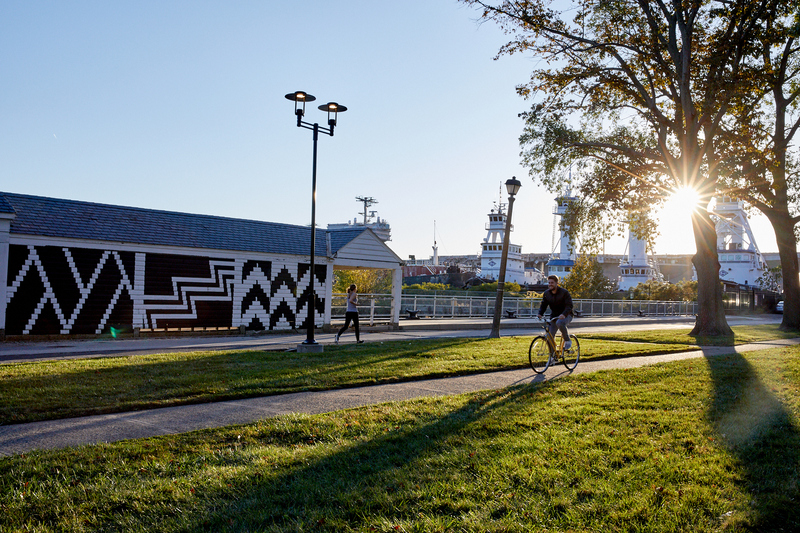 Navy Yard businesses can take advantage of free discounts on annual passes and discover the joys of bikeshare. Take a step to help improve your employees health while gaining access to substantial discounts on the most affordable transportation option in Philadelphia! Purchase a $30 club level ticket and enjoy an afternoon of fun with the World Famous Harlem Globetrotters on March 3, 2019; $5 from each ticket sale goes to benefit the local Bregy Elementary School. Navy Yard employee discounts and special packages available for Wells Fargo Center events and concerts. To redeem your discount, please use promotional code: GRPPIDC.